Thirty years ago, Susan Sontag famously wrote, "Everyone who is born holds dual citizenship, in the kingdom of the well and the kingdom of the sick . . . Sooner or later each of us is obliged, at least for a spell, to identify ourselves as citizens of that other place." 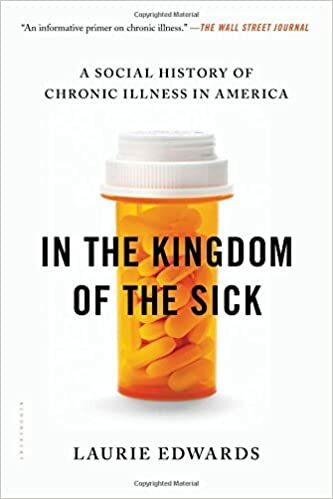 More than 133 million Americans now live with chronic illness, accounting for nearly three quarters of all health care dollars and untold pain, disability, and heartbreak. Patients with diseases as varied as HIV, cancer, or type 2 diabetes have been stigmatized, accused of causing their preventable illnesses through their lifestyle choices. People with irritable bowel syndrome and female patients with chronic fatigue syndrome have been told their symptoms were due to anxiety; and millions of people with chronic pain have faced skepticism from physicians and the public alike. What The Noonday Demon did for people suffering from depression, Laurie Edwards does for those who are chronically ill, championing their cause and giving voice to their lament. Disease, www.fightchronicdis ease.org/issues/about.cfm. 2. “SWHR Timeline,” Society for Women’s Health Research, www.womenshealthresearch.org/site/PageServer?pagename=about_timeline. 3. Porter, The Greatest Benefit to Mankind, 15. 4. Sontag, Illness as Metaphor and AIDS and Its Metaphors, 3. 5. Porter, Greatest Benefit to Mankind, 29. CHAPTER 1: FROM PLATO TO POLIO 1. Wall, Encounters with the Invisible, 8. 2. Kamen, All in My Head, 90. 3. Sontag, Illness as Metaphor, 6. 4.